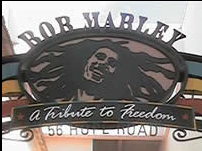 Bob Marley – A Tribute To Freedom is Orlando’s celebration of reggae music and culture. Located at Universal Studio’s City Walk, it is an authentic replica of Marley’s home in Kingston Jamaica commemorating the “King of Reggae’s” international fame and Jamaican heritage. Lush greenery and artifacts from Marley’s legendary career surround guests in an open air veranda and courtyard. Over 100 photographs and paintings reflect pivotal moments in Marley’s life. Video monitors take guests on a musical journey of Marley’s life, from his childhood in rural Jamaica to the height of his international musical fame. Dine on a Jamaican inspired cuisine while enjoying Jamaican music performed by local Reggae bands. This is an Orlando experience in food and music not to be missed!